When someone starts collecting carnival glass vases sometimes it is very difficult to identify the pattern; they all seem to look alike. We will try and help explain the differences of 6 vases that look a lot alike but are very different. There are April Showers, Knotted Beads, Long Thumbprint Hobnail, Rustic, Swirled Hobnail and Tree Trunk. 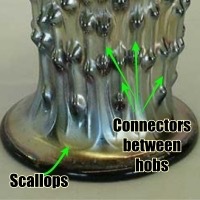 Fenton’s April Showers vases have connectors between the hobs and also have scallops near the base. 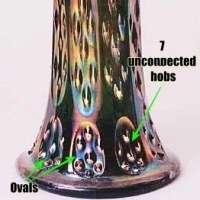 Fenton’s Knotted Beads vases have 10 connected hobs in each oval. 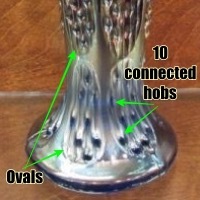 Fenton’s Long Thumbprint Hobnail vases have 7 hobs in each oval and they are not connected. 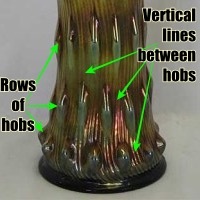 Fenton’s Rustic vases have rows of hobs that start at base and go up the vase. 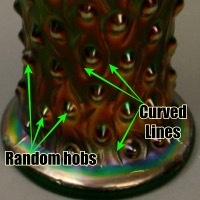 Millersburg’s Swirled Hobnail vases have rows of hobs and vertical lines between all of the hobs. The lines go below the bottom row of hobs. 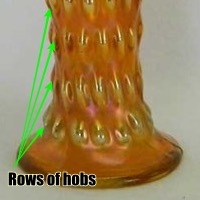 The base has a rayed pattern. Northwood’s Tree Trunk vases have random hobs and curved lines (almost like parentheses) that are part of the pattern around some of the hobs.